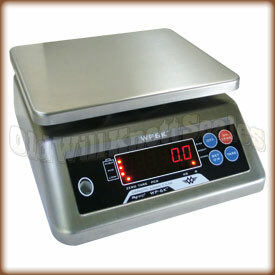 Compact bench scale with IP68 housing and programmable dual display. Platform Size 8.9" x 7.4"
Scale Size 9.25" x 11" x 4.5"
IP 68 Waterproof Housing The WP6K washdown scale has a waterproof housing with an IP (Ingress Protection) rating of 68. This means the WP6000 is protected from dust and complete, continuous submersion in water up to 1 meter. Programmable Dual Display My Weigh designed the WP6K with two weight displays; one on the front and one on the back. This feature makes it easy to use the scale from the front or the back. If ya just don't need the display on the back, you can set the scale to single display mode. This will save ya some energy in the long run. Checkweighing With Programmable Buzzer Make sure ya get your weights just right with this waterproof scale's check weighing feature. When ya weigh in this mode, you can set weight limits for the stuff you're weighing. So if your sample weight is too low or too high the WP6K will sure let ya know. You can even program the scale's buzzer to sound for an audible alert. Does This Thing Count? You bet it does! All ya need to do is weigh a sample amount of pieces, so the WP6K can know how much each piece weighs, then start counting. You'll be finished in no time. Easy To Clean Membrane Keypad & Display You won't have to worry about dust and dirt getting stuck under and around this waterproof scale's buttons and display...The WP 6K has an easy to clean membrane keypad with accurately labeled keys for easy weighing. Durable, Stainless Steel Construction This waterproof scale has a stainless steel housing and a stainless steel platform for easy cleaning. Great for heavy use! Liquid Level Indicator & Adjustable Feet To get the most accurate weight readings from this waterproof scale, My Weigh designed the WP6K with a liquid level indicator and adjustable feet for adjusting the balance. 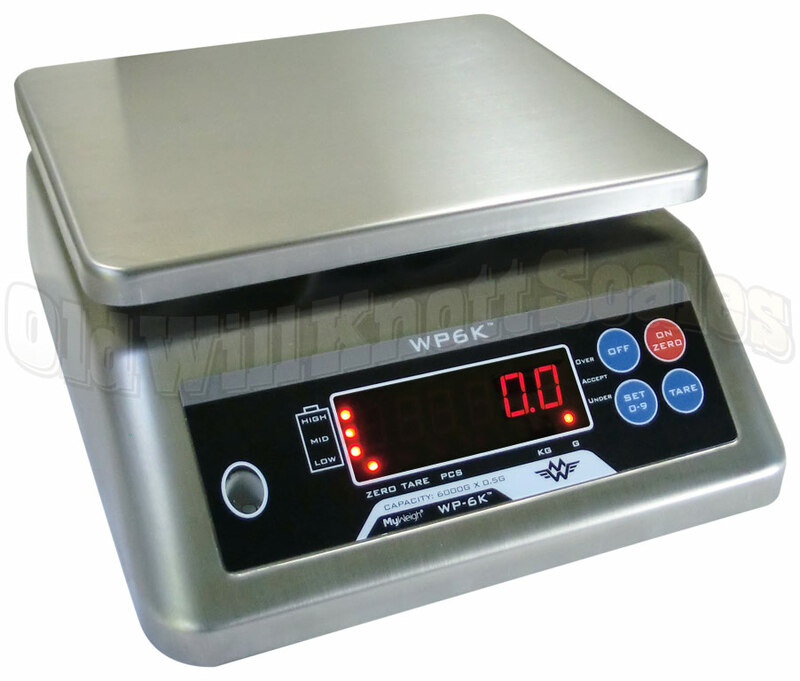 Tare Feature The tare button on the WP-6K weight display can be pressed to "zero out" the weight on the scale. You can then add more weight, and the display will only show the weight of the items you're adding.